Mother-daughter team Babette Haddad and Melissa Haddad Malaga, in partnership with Quality Meats veteran chef Stratos Georgedakis, have opened Maxwell's Chophouse in a 1909 Beaux Arts-style building. The 126-seat restaurant serves oysters Rockefeller, dry-aged beef porterhouse and other steakhouse classics. Maxwell's Chophouse, 1184 Broadway, New York, NY 10001, 212-481-1184. Pastry chef Pichet Ong's new 70-seat Hell's Kitchen spot Chaan Teng serves up a modern take on Chinese food, like Singapore chili crab cakes, spicy pork shumai and a crab rangoon nacho. Chaan Teng, 698 Ninth Ave., New York, NY 10036, 212-235-1886. In the old Rat Cage Records space (where the Beastie Boys recorded) is a new Vietnamese restaurant called Chao Chao. Chef/owner Stephan Brezinsky, formerly of Il Mulino and Pok Pok, cooks up dishes like beef cheeks rendang and skate wing grilled in banana leaf. Dear Irving’s Tom Richter is the man behind the cocktail list. Chao Chao, 171 Ave. A, New York, NY 10009, 212-475-3171. Southern-born and -raised Adam Lathan and Clay Boulware bring the bayou to Brooklyn with the opening of their first brick-and-mortar eatery in Cobble Hill. The Gumbo Bros serves authentic gumbo and po' boy sandwiches, plus New Orleans cold brew style chicory coffee. The Gumbo Bros, 224 Atlantic Ave., Brooklyn, NY 11201, 212-749-5511. 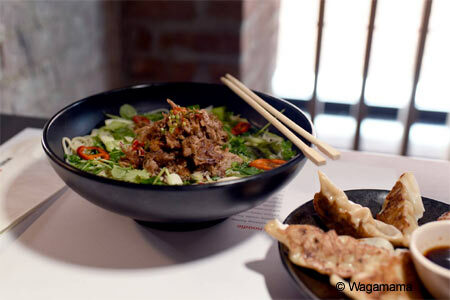 London’s popular noodle chain Wagamama has its first New York City outpost. The three-story space looks over Madison Square Park and the menu offers ramen, fried chili squid and Korean barbecue beef buns. A second East Village restaurant is slated to open soon. Lunch & Dinner daily. Wagamama, 210 Fifth Ave., New York, NY 10010, 212-920-6233. Gerardo Gonzalez of El Rey has opened Lalo in Chinatown. The menu takes its inspiration from Mexican, Japanese, Middle Eastern and Ashkenazi-Jewish culinary traditions, with dishes like Chamoy char siu ribs: baby-backs with a Mexican sour plum sauce. Dinner nightly. Lalo, 104 Bayard St., New York, NY 10013, 646-998-3406. The Atwood Kitchen & Bar Room team has launched the 127-seat Shay & Ivy. Executive chef Brad Warner is cooking dishes like pappardelle with mushrooms, Amish free-range roast chicken and duck confit spring rolls. Breakfast, Lunch & Dinner daily. Shay & Ivy, 39 W. 24 St., New York, NY 10010, 646-666-8635. At F.O.B. on Smith Street, Daniel alum Armando Litiatco and partner Ahmet Kiranbay serve dishes like grilled duck breast with lemongrass and fish grilled in banana leaf from their open kitchen. Look for avocado tapioca shakes and halo halo for dessert. Dinner nightly. F.O.B., 271 Smith St., Brooklyn, NY 11231, 718-852-8994. Gowanus coffee counter and butcher shop A&E Supply Co. is owned by “Top Chef” alum Adam Harvey and his partner Ennio Di Nino. They serve Dough doughnuts and Brooklyn Roasting Company coffee, and offer Vermont Stonewood Farm turkeys for Thanksgiving. A sit-down restaurant in the space is forthcoming. Breakfast & Lunch daily. A&E Supply Co., 548 Fourth Ave., Brooklyn, NY 11215, 929-295-8025. Restaurateur John McCormick of Maison Premiere and Vannesa Shanks, formerly of Nobu, have opened this bicycle-themed spot in the onetime Cafe Moto space. Bar Velo's all-vegetarian menu features a BBQ eggplant sandwich and a black bean portobello burger with garlic aïoli. Expect live music on weekends. Dinner nightly. Bar Velo, 394 Broadway, Brooklyn, NY 11211, 718-599-6895. The owners of Smith & Mills and Navy have opened this casual, sleek spot with chef Daniel Berg, formerly of Daniel and Locanda Verde. Yves serves dishes including grilled octopus with figs, and potato gnocchi with Manila clams and bacon. Breakfast, Lunch & Dinner daily. Yves, 385 Greenwich St., New York, NY 10013, 212-431-3385. Don't be confused: the new H&H Midtown Bagels East is actually on the Upper West Side. It’s a cousin of the beloved bagel institution that closed in 2011, so the stakes are high. The shop sells hand-rolled bagels and prepared sandwiches. Breakfast & Lunch daily. H&H Midtown Bagels East, 526 Columbus Ave., New York, NY 10024, 212-734-7441. Alamo Drafthouse, the highly anticipated dine-in movie theater from Austin, is now open in downtown Brooklyn. The cinema has two stories, seven screens and a cocktail bar with 19th-century wax figures. Food is served during the movie, like flatbreads, ropa vieja beef tacos and a porter ice cream float with agave nectar and bitters. Lunch & Dinner daily. Alamo Drafthouse, 445 Albee Square W., Brooklyn, NY 11201, 718-513-2547. Hart’s is an intimate 30-seat Bed-Stuy restaurant serving elegant Mediterranean-inspired food, like pollack with squid and beans and clam toast with pancetta. Natural wine and cocktails like the Che Figata with Cynar, vermouth and soda are available, too. Hart's, 506 Franklin Ave., Brooklyn, NY 11238, 718-636-6228. 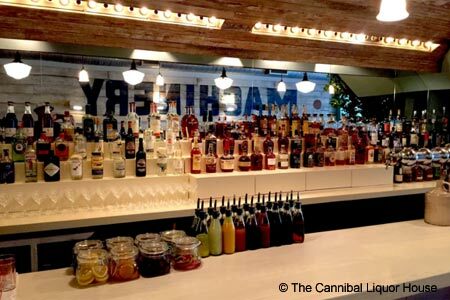 The Cannibal Liquor House is now open in the former Resto space. It’s a sister restaurant to the adjacent The Cannibal Beer & Butcher. The new spot is a cocktail lounge serving snacks and bar food from Cannibal chef Francis Derby. Look for veal cheek with Yorkshire pudding. The Cannibal Liquor House, 111 E. 29th St., New York, NY 10016, 212-685-5585. Bustan on the Upper West Side has debuted a new cocktail program from mixologist Kelsey Didit. It includes drinks like the Why So Serious, made with the Israeli anis spirit arak blended with Jamaican rum, loganberry liqueur and grapefruit. Didit is the beverage director at cocktail spot Wolf & Deer in Brooklyn, too. Brunch, Lunch & Dinner daily. Bustan, 487 Amsterdam Ave., New York, NY 10024, 212-595-5050 .